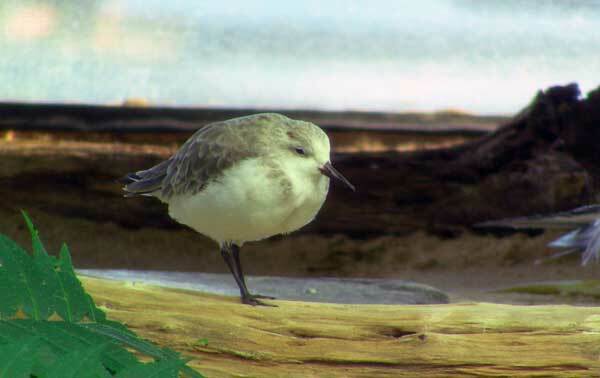 Meet our dunlin. She was found along the Cape Cod Canal in 2003 with a fractured left wing. Vets at the Cape Wildlife Center rehabilitated her before she found a permanent home in our exhibit. She can fly a little but not well enough to make her annual breeding migration from as far south as Texas all the way to northern Hudson Bay in Canada. This picture captures her in her winter plumage, check back soon to see her in her beautiful breeding colors! 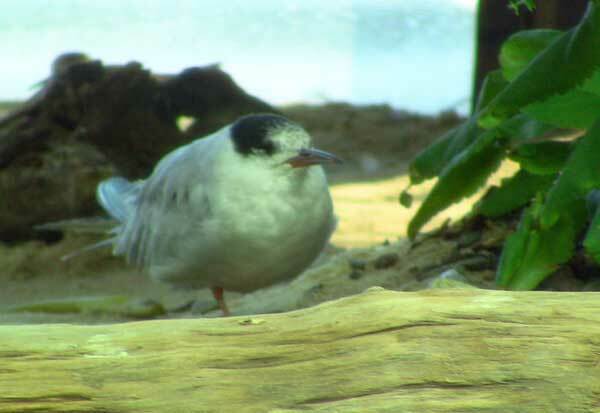 Our exhibit holds one common tern. We nicknamed her "Ike" before we found out she was a female. Ike was found as a chick in the summer of 2005 on a beach in southern Massachusetts. She was mistakenly though to be abandoned by her parents and was brought to a rehabilitation center before we eventually gave her a permanent home. Tern parents often leave their chicks on the beach while they fish offshore. So if you ever see a tern chick without a parent watch it for a while and I bet you'll see an adult come back pretty soon with a beak full of fish. If you don't see a parent return then contact a local wildlife rehabber or your local animal control officer before you try to handle any wildlife. Ike is perfectly healthy and can fly very well but we can't release her back into the wild. Common terns need their parents to show them how to migrate and forage for food. We sometimes see her catching live silversides out of the exhibit pool but she's not very good at it, she prefers to eat defrosted fish out of a bowl! 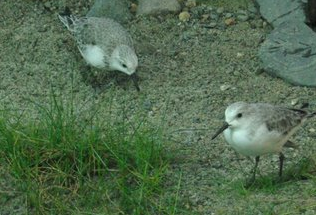 Our exhibit holds two sanderlings, a male and a female. The male comes to us from a former exhibit and can fly very well. The female was found in the winter of 2007 on a beach on Long Island. Vets in New York discovered severe fractures of her radius and ulna and successfully rehabilitated her, although she can not fly. She therefore has found a permanent home in our exhibit. You can tell her apart from the male because of her slightly droopy right wing. 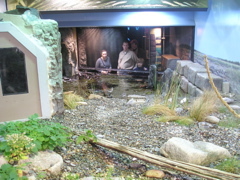 A peek behind the scenes of the shorebird exhibit - the secret door! On Tuesday I posted a riddle asked by many of our younger visitors: "how do you get out?" It does appear from the visitor side that when I'm in the shorebird exhibit I am in fact stuck. I'm always reassuring visitors that my colleagues and I can get in and out quite easily through the "secret door." You can see our escape hatch on the left hand side of picture which was taken from inside the exhibit looking out. We do sometimes accidentally lock each other in the exhibit, so we do get stuck, but that's another story!